ROGER Tan has come a long way since his small town boy days in Yong Peng, Johor. From living in poverty as a young lad to becoming a successful lawyer in Malaysia, it is not hard to see that Tan values hard work, discipline and determination. These values are what have made him the man he is today. Despite having achieved a lot in his life so far, it is evident that Tan harbours a lot of pain and anguish. On May 23, 2000, his father, Tan Sue Yong, the person who inspired Tan to become the man he is today, went missing after a walk about in Yong Peng town. His anguish lingers as 11 years later, his father has still not been found. Tan is emotional when speaking to StarBizWeek about his father. “11 years have passed. Actually I've done all I can but we still can't locate him. I've gone on national television and used the press in every form. This is one area I feel that I've failed him.” Tan's wish is to get closure on his father's disappearance. “Even if we can't find him alive, the least that we want is to find his body and give him a decent burial,” he said. It is obvious from the way that Tan speaks of his father, that he looks up to his father, just as every little boy does to his own dad: with a sense of admiration and awe. His father comes from the rich Zheng family in Fuzhou, China. Due to the onset of communism, Sue Yong and his wife Swee Mei left China and came to Malaysia. “The Zheng family assets were taken by the communist in 1949,” Tan says recollecting his family history in China. Here, his father and mother laboured as pig-farmers in Sepang, Selangor. Living under such poor circumstances, Swee Mei went through a few miscarriages. In 1958, they decided to move to Yong Peng. Meals were often porridge with soy sauce or a few slices of preserved bean curd. His father was then working as a labourer for landowners. Clearing weeds and lalang, and making drains required a lot of physical work. Despite the effort and pain, the job only earned his father RM6 per day. Tan's two elder sisters gave up school at the age of 10 to be rubber tappers to help increase the household income. In the mid-1970s, Sue Yong took a job as a tree feller. He often had to dye his hair in order to secure contracts for fear that prospective employers would think that he was too old to work for them. Roger attributes his success to his father, who inspired him to work hard and persevere. “The only way he could support his family was through sheer hard work and also determination. Whatever he had set his mind on doing, he was determined to see that it succeeded,” Tan says. Though he and his siblings grew up in tough conditions, often surviving on meagreness, they certainly made do with what they had. As children, they still found ways to have fun. They played games that most children in this day and age do not. It has often been said that the best things in life are free, and that was true for Tan, his siblings and his friends. They often played with catapults, kites, and the like. Learning Mandarin was not an option. Most of Roger's friends in school spoke Mandarin instead of English. Also, being in Johor, they were exposed to Singapore's Mandarin television channels. Being conversant in Mandarin, and the use of the language as his mother tongue, Roger had to put in a lot of hard work and effort to improve his English. His experience as a student representative while taking a pre-university course at Tunku Abdul Rahman College (TAR College) opened his eyes. He understood then that it is important for him to be flexible especially in terms of setting moral standards. He learnt to respect others and their rights by accommodating their views. Prior to furthering his studies in law in London, he taught English at a local Chinese school in Batu Pahat, Johor. He had always had an interest in learning about the law and what it encompasses. His role as both a high school head prefect and a student representative at college was causal to him mixing with a more matured crowd. During the four years he spent in London, he learnt how to deal with all sorts of people and that eventually helped him with his law studies. His professional career as a lawyer really took off when he was given the opportunity represent the Johor State Government in several privatisation projects. He moved back to Johor Bahru in 1993 when the state government requested him to set up a branch there. He felt that he was giving back to the country in terms of national service in becoming the commissioner for the National Services Commission (SPAN). Prior to that he also helped the Ministry of Housing and Local Government to draft the Housing Developers (Control and Licensing) (Amendment) Acts of 2002 and 2007 and their regulations. He served at the Malaysian Bar Council from 2004 till 2009, and was solely responsible for the revamp of the Malaysian Bar Council's website. He regarded it as a full time job, working on it from the wee hours of the morning atl 5am. He did this for four years. A new image for the Bar Council was created to help people and other lawyers better understand the issues that it deals with. Also, Roger was appointed a board member of Solid Waste Management and Public Cleansing Corporation, which often deals with companies such as Alam Flora. As the water commissioner for SPAN, Roger is very concerned about the water issues that surround the country. He feels that the states should migrate their concentration to service areas. “On the other hand, investment in capital works should be left to the federal government,” he added. The aim of the Water Services Industry Act 2006 is to make the water industry asset light. All assets and capital expenditure is shifting to Pengurusan Aset Air Bhd (PAAB). However he feels that there is still more to be done in this area as he feels that Malaysians take for granted the fact that we are blessed with water. What should be understood is that all water must be first treated before being made ready to consume as drinking water. In this sense, the conservation of water is very important and he feels that the public should be educated to conserve the usage of water. His hope is that the non-revenue water will be resolved in the near future. Non-revenue water is the water that is transported from the treatment plant to individual houses. Currently, leakage problems caused by old pipes have not been replaced. Due to this, only 70% of water that is being treated and sent out reaches the houses. Water asset management company, PAAB, is trying to solve this problem. However, it does require a large investment to do so.Also, if the Selangor water issue is not resolved soon, it is very possible that there will be a shortage of water in Selangor, Putrajaya and Kuala Lumpur in 2014. Tan remembers the freedom he had in London, when he was sent to study there and regards it as his second home. He continually thanks his sisters for supporting him and knows he was privileged enough to be given an opportunity to study abroad. It was there that he really learned to be independent at a young age; having to do everything by himself, including cooking. “However, my wife would now complain that I don't cook anymore,” he said jokingly. Tan tries to instil in his children all the values that his own father instilled in him. “I guess my children are able to see why I emphasise on these values especially hard work.” He illustrates with a quote by Ruth E. Renkel: “Sometimes the poorest man leaves his children the richest inheritance.” His aspiration for his four children aged 21, 19, 16 and 15, is that they will excel in their studies so that they can have a good career. However, it is more important that they will walk right with God. He is one who can never say “no” to his wife. “I've never said no' when she asks me to do something,” Tan says. He and his wife keep their relationship alive by never taking things for granted and by always believing that they will be there for each other in times of happiness and trouble. He enjoys photography especially with outdoor shoots. 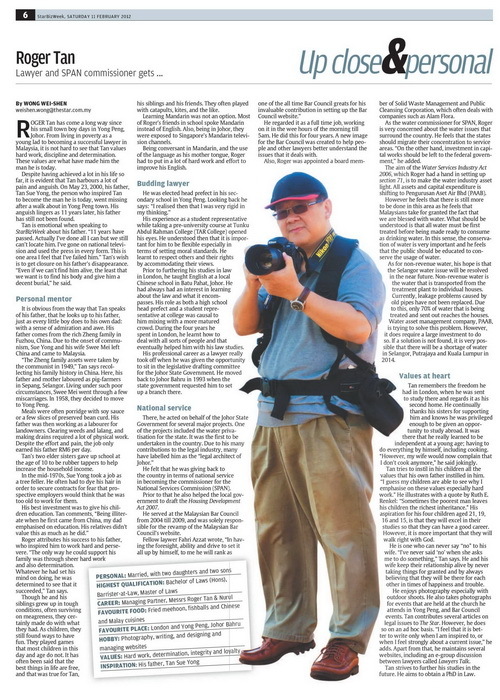 He also takes photographs for events that are held at the church he attends in Johor Bahru, and Bar Council events. Tan contributes several articles on legal issues to The Star. However, he does so on an ad hoc basis. “I feel that it is better to write only when I am inspired to, or when I feel strongly about a current issue,” he adds. Apart from that, he maintains several websites, including an e-group discussion between lawyers called Lawyers Talk. Tan strives to further his studies in the future. He aims to obtain a PhD in Law. *I have edited some parts of the above article to ensure factual accuracy. Truly an inspiring story. Makes me think of my Dad's hard work under the sun despite him ageing now, just to get me into law school and the thought of disappointing him that I might not be able to practice, just hurts. When Roger shared how his father has inspired him, I thought of how Charles Handy talked about his father in his autobiography. Many a time we couldn't feel what our parents have taught or shaped us till we made a retrospect. Roger, I salute your continuous contribution of ideas, articles and effort to make our nation a better place.